Here are some stories inspired by this mysterious picture, sent in from around the world! There was a time that could be past, present or future. In this odd era there lived a boy named Girl, a crow named Robin, and a dog named Cat. The three companions often traveled to the past to see how things came to be and to the future to see how things will come to be. They used a simple portal of sorts in a dressing closet to travel the years. Twas a strange object yet it provided knowledge for those who sought it. Girl, Cat and Robin would be spun and thrown until they reach the era in which they would like to stay. They most commonly traveled to the year 5492 for that was the year gravity was defied. They discovered this portal when hiding from Sir Seagate of Ranteed in the dressing closet of the servants¹ quarters. Girl would be punished for bringing the animals in the castle. He and his pets huddled in the corner of the closet and started to fall. They were utterly terrified as they were thrown and spun throughout time. They had fallen for ten minutes when he discovered what had happened. He began to think of ways to stop the dreadful fall. First he yelled, "Stop!" His first attempt had failed. The second attempt was more successful. He yelled "Time!" and Girl (clunk), Robin (thump), and Cat (bang) fell to the ground. He was happy the fall had ended and even happier to find he had discovered a wonderful way to escape polishing Sir Seagate's shoes. As I heard the shrieks of a puppy I curiously looked into the white vortex. There I saw a puppy and a raven. I rushed in to save them by the strong vacuum sucked me in. As I cried with fear I saw a white flash of light that looked like the flashes of a hundred cameras flashing at once. It took us to a weird place. It seemed like we were Alice going into Wonderland. As I followed the Yellow Brick Road I met the Nutcracker King. He wanted me to help him to get to the Wizard of Oz. On the way there we were chased by a witch on a vacuum cleaner. I ran away leaving my friend the Nutcracker alone. I went back through the portal. I heard a loud buzzing sound, it was my alarm clock. Now every time I walk past a mirror I see the Nutcracker being followed by a witch on a vacuum cleaner. One day a boy named Harry who lived in the country was chased by a dog that looked like a bear. He ran into a shed; so did the dog. Harry ran into a wall. A bird's nest fell on him, but he was unaware birds lived in the shed. A vindictive crow saw the dog also thinking it was a bear and attacked. Harry pulled the crow off of the dog. Soon, it became a circle of fear and frenzy. Harry and the dog then ran out of the shed in fear. There once was a little girl named Maggy that wanted many pets. She wanted a dog, cat, crow, and a mouse. Her family was not rich and they could not afford all of those animals. She narrowed it down to either a dog or a crow. Maggy could not decide which one she wanted, but her father said that she could have both. She dreamed that they could live in the shed and they would be best friends. When the next day came they went to a small pet shop down the street, and there was this very cute dog sitting in the corner of the shop. In a cage there was this big crow sitting very quietly. She decided she wanted the quiet crow and the cute dog. Maggie named the dog Eddie and the crow Max. When suppertime came, Maggie took her two new pets into the shed and stayed with them for a little while. She went inside and heard barking. Maggie ran into the shed to find Eddie and Max chasing each other around the shed. She tried to stop them but before she could, Max flew out the window. Their family was very sad, but Maggie knew that both animals would not be able to fight anymore. One day Paul came home with a pet crow. Then Paul ran to the house and put the cage on his bed. Paul's dog went up into his room and hit the cage down on the floor. The crow looked up at the dog and the dog started to bark loudly. Then the crow went crazy in the room. My dog was jumping around in my room, and the crow was flying around because he was scared of my big dog Fred. I put the crow back into his cage, and the dog back into his bed. I woke up and the crow was not in his cage. My dog was not in this bed too. So I ran outside and I saw them eating their food next to each other. The dog and the crow became friends. Jerry is a little boy who is 10 and goes to school in Nebraska. His birthday party is tomorrow and he wants a dog more than anything in the entire world. The next day at school he saw his mother and his father at the pet shop across the street. He got so excited that he didn't pay attention all day. He just thought of a name for his dog. Later that day his party finally started. All he did at the party was think of names for his dog with his friends secretly away from his mother and father. He had hardly touched his cake and he opened his presents. He got a lot of cool stuff. Then his parents came with a big pet box he opened it and it was a crow in a big cage. He pretended that he liked it and they said they would leave him alone with his crow and he called it Bradley, what he would have called his dog. Then his Mom called him to come to the shed he was so mad he hit the cage and the door opened. He went to the shed and saw his dog. The crow got scared when he hit the cage and the crow went after Jerry. The door shut and the dog protected him. Once upon a time there was a boy named Shane. One day the father told Shane to clean the garage. When Shane was cleaning the garage, he found this large mysterious box- like machine. He wondered what it was and what it was used for. Shane was going to ask the father what this mysterious machine was, but then he decided not to ask the father but to figure it out himself. When he was thinking about the box-like machine, he tried looking for a way to turn it on or to get inside it. Somehow he touched a button, and all of a sudden, it lay out a carpet but did not open. Shane was confused but he examined the carpet but then he decided to step on it but when he did nothing happened. Shane said, "What does this machine do?" He then said, "Wow, imagine if this machine was a time machine." Then in that sudden moment a gust of wind picked him up, circled him a round in a circle and brought him in this awkward place where birds would fly. He then walked around and saw a bird and he said, "Hi". But then he wondered why am I talking to a bird? Then the bird said, " Hi my name is Raven, what are you doing here?" Shane was discouraged and could not believe he talked. Then Shane asked, "How did I get here?" Raven said, ³Don¹t you know you took that machine that made a racket and scared all of us birds." Shane asked were the time machine went and raven did not know. He asked if Raven could help him find the machine. They walked for hours and on their way they met a dog named Max. Max asked, "Why are you here?" Shane said, " Why I am looking for my time machine." Max said, "Why you should have come right here because it is right here." Shane was so happy, but he was said he had to leave his friends so he asked them if they wanted to come with him and they were on there way home and when they got home Shane asked his father if he could keep his animals and the father said, "Yes." But sometimes he and his animals go on the time machine for little rides. Once upon a time this 13 year old named Charlie was coming home from school and his parents said, "We are going on a vacation for a couple of days." "Charlie's parents said ³You'll be fine, right?" Charlie said, "Yea, mom. Yea, Dad. I'll be fine, and I'll take care of Tweety and Mitty which are the animals. Don't worry, we'll be fine. Bye have a nice time." So Charlie and the animals were watching tv, and playing games. They were having so much fun they were so tired they all took a little nap. When they woke up they wanted to go outside and play in the snow because it was winter and it had snowed. So Charlie went to go get his jacket in the closet and he fell and was sliding down this tunnel. He landed on the floor and was screaming so loudly the animals heard Charlie and went into the closet and fell too. Charlie said ³This never happened before!² Then he realized that he never used this closet before and neither had his parents. He just felt like using it today. Charlie and the animals started getting really cold and felt something - a gust of wind - and went into the tunnel. The wind came because before he went to go get his jacket he opened the door to outside because he was just going to be a minute anyway to get his jacket but I guess not. They were walking through the tunnel and finally they found a way out and it lended to outside. And when his parents got home Charlie told them and they moved to another house. There once lived a boy named Josh and he had a dog named Rufus. The boy was six years old and very curious. He liked to wander around and look at different things. Sometimes he would get himself in trouble with his father and mother. One day he went for a walk with his dog. The dog ran off into the woods. He did not bother to tell anyone about what happened to Rufus. He heard the dog bark, so he ran in the woods. Then he saw something, and it was his dog running after a crow. All of a sudden the dog ran into the cave after the crow. The boy was scared, but curious. So he decided to go into the cave after Rufus. When he was in the cave a sudden gust of wind came rushing by. The cave began to shake. He was yelling for help. No one heard him. 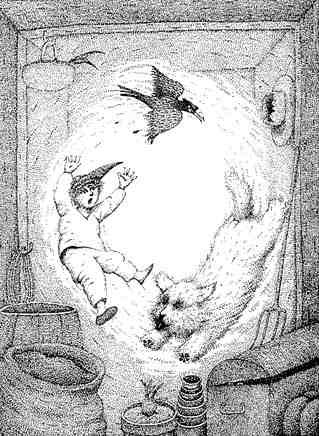 The dog and the boy ran as fast as they could while the crow followed them home. When he finally got home he ran in the house and told his mother and father. His parents were shocked when they heard the story. Then the crow went home to his family, and the boy went inside. The boy never went in the woods ever again and learned his lesson never to wander off by himself again. THIS STORY IS ABOUT A BOY WHO ALWAYS WANTED TO GO ON A ADVENTURE WITH HIS PETS. His name was Peter. Peter also had two pets their names were Tiger and Victor. Tiger and Victor were walking in the field we they fell into a hole in the ground where Peter found a stick and tore off a piece of his clothing and wrapped it around thee stick. Luckily he had some matches in his back pocket. He lit the clothing on his stick with the matches and made a torch out of the that. Then as they were walking along they stumbled along a piece of map. Što be continued. One day a small boy named Thomas was walking through the fields of his grandfather¹s farm. In the distance Thomas saw a tornado and started to panic because he was too far away from the house to run there. The only thing in sight was an old shed that caught fire many years back and had never been rebuilt. Thomas thought about it and that was the only place to be safe. He ran as fast as he could to the shed for cover but unfortunately the door was locked and he struggled to get it open but just couldn¹t. The winds were getting stronger and he could not hold himself to the ground. Before he knew it he was being lifted up into the funnel by the strong force. He started to scream for help but no one could hear him with the tremendous noise coming from the surroundings. The funnel whipped around like a blender picking up everything and knocking down houses and trees getting in the way. Cars were overturned and the streets were blocked by the trees that had fallen. After about 5 more minutes of the disastrous tornado, the funnel cleared away and the dust started to lift. Thomas was left under a telephone pole that had fallen. But luckily someone ran outside looking for him and heard him screaming for help from the pain of his crushed legs. The woman had called 911 and an ambulance was pulling up to the house. The EMTs jumped out of the truck in a quick hurry to help the young boy. They got the pole off of his legs about an hour later and the boy was hospitalized and would be in the hospital for a few days. Thomas had survived the disaster and was very brave. of Mt. Carmel School for championing her student's creativity!! Find out more about children's book artist and author Peter Sis.